Last week my Internet service was down for about 8 years hours. Of course my mind, with its flair for drama, went into panic mode. "What if something happens somewhere to someone and I'm the last person on the planet to find out?" "What if someone has a question about a recipe that will be ruined if I don't answer within the next five seconds?" What if that same person ends up hating me and tells everyone that I'm mean and that I ignore emails?" And perhaps the most frightening; "What if service is never restored, and I'll never be able to post a recipe, or Tweet, or know what Tom Hiddleston is doing!?" After I calmed down enough to be semi-rational, I took a breath, went outside, and read a book for 2 hours straight. (Something that I usually reserve for my bedtime ritual...it rarely lasts longer than 30 minutes.) It was surprisingly enjoyable, and relaxing, and rejuvenating. 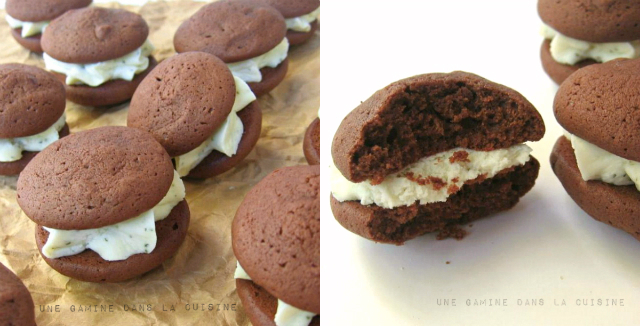 What I adore about whoopie pies, aside from the name, is their cakey texture. Most of the time, I don't like cakey cookies, but whoopies manage to pull it off beautifully. These little gems taste like rich brownie bites. In fact, the first "baking-time test batch," was incredibly gooey and fudgy. Unfortunately, their tender little bellies didn't hold up to well when the filling was added, so I had to increase the baking time. Still delicious though! If you are so inclined, I think these cookies would be excellent broken up into some plain vanilla ice cream. Kind of an homage to Ben and Jerry's mint chocolate cookie ice cream! Now that my recipes are organized, and I finally finished reading The Girl with the Dragon Tatoo, (Loved it! ), maybe I'll be able to tackle organizing my closet...something that frightens me even more than being disconnected. In a separate, large mixing bowl, whisk together the flour, cocoa powder, baking powder, and salt; Set aside. Once the chocolate and butter mixture have cooled off slightly, whisk in the sugar. Add the eggs, one at a time, whisking well after each addition. Whisk in the vanilla. Add the dry ingredients, and using a large rubber spatula, fold them into the wet until all the streaks of white flour have disappeared. Try not to over-mix. Bake the cookies for 6-8 minutes, or until the tops spring back when lightly touched. Remove the pans from the oven and allow the cookies to rest for about 5 minutes before transferring them to a cooling rack. Cool completely before adding the filling. Pipe or spread the filling onto half of the cooled cookies and top with the remaining halves. These look a - ma - zing!! I really enjoy your photography too, Valerie!! though super annoying to not have internet, it is awesome you got a chance to read - and make these amazing treats :) i'm jealous that you were able to organize recipes - i'm so far behind on that! Looks like your internet-free time was well-spent! Irresistible! I could eat a few of those for dessert. I love chocolate and mint, but can you believe I'm the only one in my universe who does? Goodness that mint buttercream sounds to die for! Chocolate and mint are the perfect pairing, Valerie. 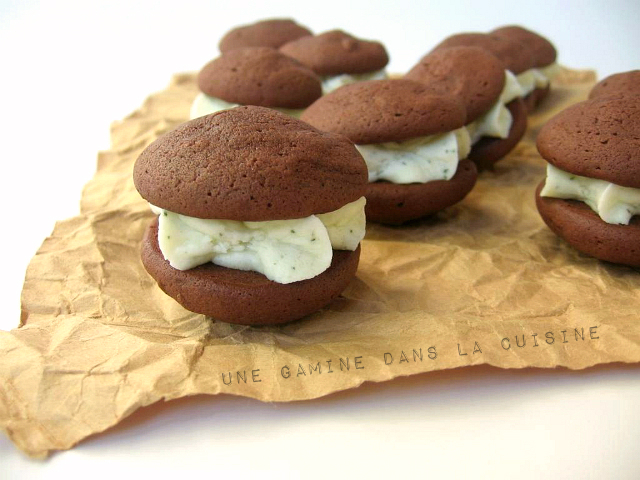 These chubby little Whoopie Pies are adorable! Looks like one perfect whoopie pie! I could eat that filling by the spoonful! I just bought a whoopee pie pan from William Sonoma while in the States last weekend :) Cannot wait to give this recipe a shot. Looks delicious! Love the mint filing! @Javelin Warrior, No worries, or objections. :) Thanks for the feature! 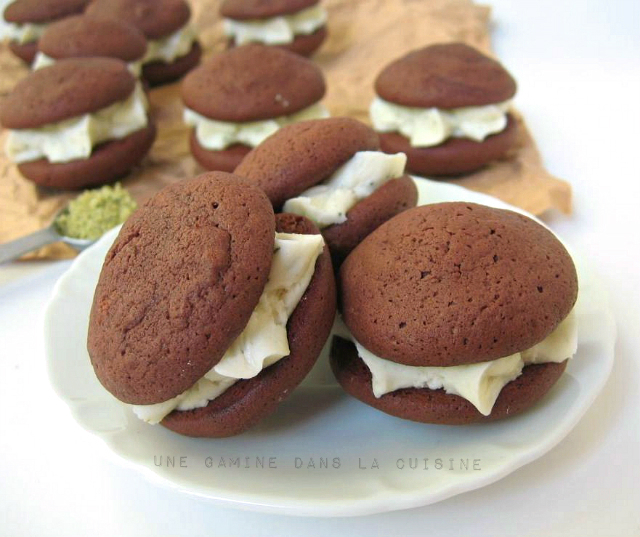 It's been so long since I've had a whoopie pie...I can't wait to try these!